Submissions are now open for Ex Oriente Film 2012, the year-long international workshop that supports the development and funding of creative documentary films from Central and Eastern Europe. Starting this year, the deadline for application to Ex Oriente Film has moved to April 20. Ex Oriente Film is an international workshop dedicated to the development and funding of creative documentary films in Central and Eastern Europe. 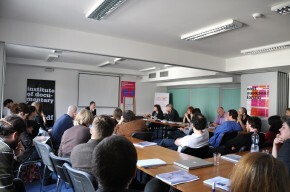 At three workshops (the 4th session focused on rough cuts is for selected projects only) that take place in the course of one year, directors and producers develop their projects and funding strategies and benefit from the assistance and valuable advice provided by established European producers, directors, experts and commissioning editors. The Ex Oriente Film training programme is completed with the co-production meeting East European Forum that gives documentary filmmakers a chance to pitch their project and secure funding from West European and North American broadcasters. The three residential workshops and the East European Forum pitching are supplemented by our Follow-up Support that keeps track of the projects until their completion. Participants: Out of all submitted projects, 14 projects will be selected, i.e., 28 participants (14 director-producer teams) will be included in the workshop. Participation Fee: The participation fee is EUR 1,500 per selected project (includes all accommodation, coffee breaks and lunches during the three workshops for 1-2 pers.). Scholarships: Participants from Bulgaria, Croatia, Czech Republic, Estonia, Hungary, Latvia, Lithuania, Poland, Romania, Slovakia and Slovenia may apply for a scholarship to cover part of the accommodation and participation fees. Applicants must prove that there is no possibility of scholarship in their own country and that the project is not supported by any development funding. Conditions of Participation: Participants must be proficient in English. All workshop sessions must be attended by both the producer and the director. To apply with your documentary project, please fill out the online entry form here. All details concerning the Ex Oriente Film are available here. Contact:Veronika Lišková, Programme Coordinator (Institute of Documentary Film) email here.